TouchGraph was founded in 2001 with the creation of the original visual browser for Google. It offers people to use special tools to discover the relationships contained in Google, Amazon、Wikis, and other popular information sources. TouchGraph Google Browser is a useful & nice tool, you can use it to find any website related network. I used it to find some Chinese blog or site close to my blog. It is really cool. 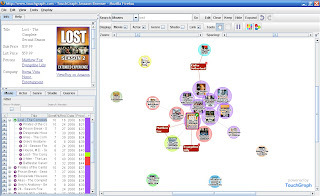 As TouchGraph Google Browser, TouchGraph Amazon Browser is another tool, that lets you explore related books or albums, see how similar items form clusters around common subjects, and discover how the clusters themselves are connected within the information space.